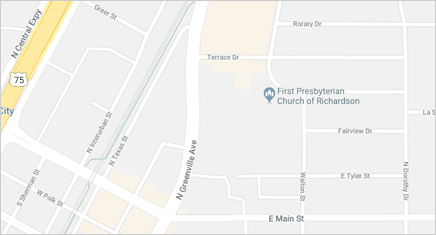 First Presbyterian Church of Richardson supports NETWORK by funding programs through its annual budget, regularly collecting food to distribute through the NETWORK food pantry, and by recruiting and sending volunteers to assist with this ministry. The Network of Community Ministries (NETWORK), founded in 1985, is a 501(c)(3) nonprofit charitable organization that was organized when FPC and several other churches came together to form an alliance to assist families through trying times. NETWORK is based in Richardson, Texas and has a service area encompassing fourteen zip codes in Dallas County. NETWORK is a non-denominational, community-based organization with currently three divisions: Emergency Services, providing food, shelter, clothing and utility services to children, adults, and seniors; the Adolescent and Children's Clinic, meeting the acute care and dental needs of uninsured children; and Seniors' Net, dedicated to providing those 60+ with the right resources to live independently in their own homes.